DONETSK, Ukraine -- Pro-Russian separatists in eastern Ukraine are going ahead with scheduled "self-rule" referendums in two regions, inviting further condemnation from the Kiev government and its Western allies. People wait in line at a polling station in the center of Slavyansk, eastern Ukraine. 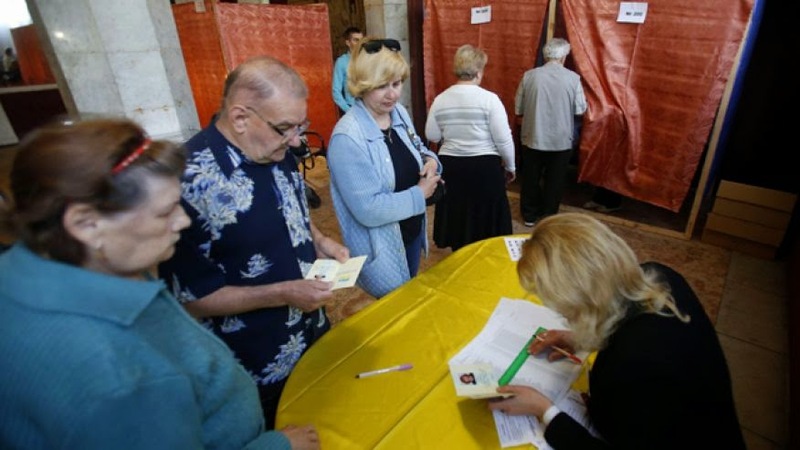 Polls opened at 8 a.m. local time (1 a.m. EDT) in the Donetsk and Luhansk regions and were scheduled to close at 10 p.m. (3 p.m. EDT). A pro-Russian election official in Donetsk described the turnout to Fox News as "colossal." "What do you expect," he asked, "when people are shooting at us?" Separatist fighters in both regions have occupied government buildings in a number of towns since Russia's annexation of Crimea in March. In the process, rebels have clashed with police and regular Ukraine troops. There were no reports of fighting as voting got under way, but insurgents in the city of Slavyansk, which has seen some of the most violent clashes between pro-Russian militants and government forces in recent weeks, exchanged fire with Ukrainian troops on the outskirts of the city overnight. The Ukrainian Defense Ministry said an army soldier was wounded in a mortar shelling near Slavyansk TV tower. And the port city of Mariupol on the Sea of Azov has remained on edge after Friday's clashes, in which at least seven died. In Donetsk, there were no disturbances reported as morning became afternoon, though some security was present at voting stations. The referendums, which seek approval to establish so-called "sovereign people's republics" in both regions, are going forward despite a recommendation from Russian President Vladimir Putin earlier this week that they be postponed. The Kiev government has repeatedly accused Russia of fomenting the ongoing unrest in the east, accusations that Moscow has repeatedly denied. At one polling station in a school in Donetsk visited by the Associated Press, turnout was brisk in the first hour of voting. All voting slips that could be seen in the clear ballot boxes showed that the option for autonomy had been selected. Many voters said they hoped the vote would help stabilize the situation. "I just don't have the words to express what is happening in our country," said the 65-year old Liliya Bragina. "I have come so that there will be stability, so that there will be peace." The polling station's head, Andrei Mamontov, said he was certain the vote would be fair and not marred by falsification. "In this polling station, everything will be fine, but I can't speak for other polling stations," he said. "We have prepared everything, we have signed everything, we have done all the checks -- everything should be legitimate and clean." Organizers of Sunday's vote have said that only later will a decision be made on whether they would use their nominal sovereignty to seek full independence, absorption by Russia or to stay part of Ukraine but with expanded power for the regions. Surveys by polling companies have indicated that a significant majority of people in Ukraine reject movements to break away parts of the country. Ukraine President Oleksandr Turchynov, in comments posted on the presidential website Saturday, said supporters of independence for the east "don't understand that this would be a complete destruction of the economy, social programs and general life for the majority of the population." Roman Lyagin, head of the Donetsk People's Republic's so-called electoral commission, said at a press conference on Saturday that the vote "is the only way to avoid war and armed conflict," predicting it will "legitimize" separatists in the eyes of the world. Late Saturday, State Department spokesperson Jen Psaki condemned the referendums as "illegal under Ukrainian law and ... an attempt to create further division and disorder. "If these referenda go forward, they will violate international law and the territorial integrity of Ukraine," Psaki continued. "The United States will not recognize the results of these illegal referenda." Ukraine is scheduled to hold a presidential election on May 25 to replace Viktor Yanukovych, who was deposed in February after months of protests over his pro-Russia stance and failure to conclude an economic treaty with the European Union. German Chancellor Angela Merkel said Saturday that Russian President Vladimir Putin must send more "signals of de-escalation" to help calm the situation in Ukraine and make presidential elections there possible. Merkel spoke Saturday after meeting French President Francois Hollande in her constituency in northeastern Germany. The two leaders stressed their view that the sovereignty referendum planned by pro-Russian insurgents is illegitimate. Merkel said: "The Russian president must send more signals of de-escalation" so the presidential elections can go ahead. Merkel said she would like to see a "national dialogue" in Ukraine start next week if possible, but didn't specify who should participate.